A delicious stir fry needs strong umami and garlic taste. A chicken flavour with rich garlic and real pepper for the best stir fry aroma. The expert of sitr-fries dishes with garlic aroma! Salt, enhancer (monosodium glutamate, sodium inosinate&guanylate), sugar, maltodextrine, corn starch, natural garlic flavour, spices (2.3%), palm fat (contains antioxidant TBHQ), chicken powder (contain antioxidant TBHQ), yeast extract, colorant caramel class III, and acidulant citric acid. 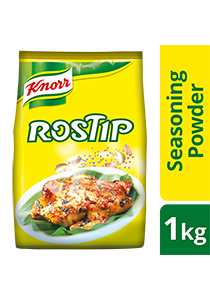 Best used as seasoning for stir fry and soup applications in Oriental and Indonesian cuisines. Use clean and dry spoon. Close pack tightly. Avoid from direct sunlight.Store in dry and cool place.